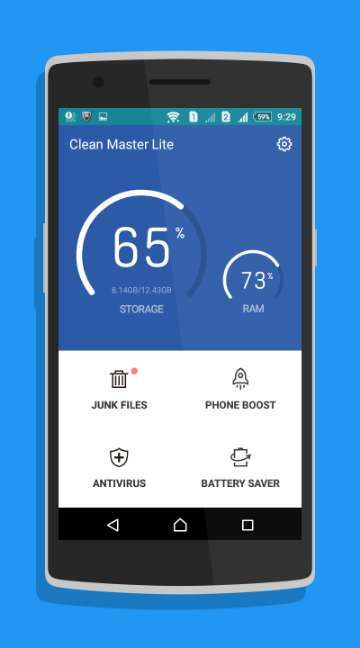 The Clean Master App improves one?s device performance by cleaning junk files, optimizing device memory, providing complete protection against viruses and managing the apps they have installed. The top half of the UI highlighted in light blue displays the amount of used space and available storage space on the SD card and the device?s internal storage. The bottom half White Part has four tiles?Junk Files, Privacy, Tasks and App Manager. This gives a basic idea about what this app does. The Junk File module helps to salvage storage space consumed by cached data, temporary files and residual files left over by apps no longer on one?s device. The Privacy module helps to clean the search history of Google Play Store and Google Search and clears call logs along with unwanted messages. One has the option to delete individual entries from inbox and call logs. The Task module kills apps and services running in the background, thereby freeing up the RAM. Task manager helps to uninstall the apps and move apps from the phone memory to the SD card. This app automatically improves game speeds by 30% when game is launching and also prevents auto starting apps by increasing the speed of phone. Clean Master packs everything that one needs to clear up disk space, gain free memory, protect one?s privacy and manage apps. It does a thorough job and does make a perceptible difference while running from time to time, especially with slower devices. This app has currently obtained 4.7 stars in Google Play store and has been downloaded 400 million times.